A toaster oven doesn’t just toast to perfection but can heat and bake, a variety of things! 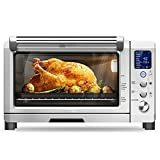 From cookies to pizza, whether you want to reheat a pita, toast a bagel for brunch or roast a chicken, there is a toaster oven to meet your needs. We understand, with so many available options, it is hard to choose! 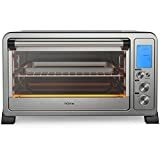 To help you decide on just the right one for you, we have compiled this toaster oven shopping guide, making the process much simpler. 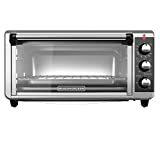 Convection Toaster Ovens: These toaster ovens are great energy savers! Using a fan to blow heated air over food, they cook quickly and evenly. Their convection capabilities mean you have more options with this oven. They come in varying sizes to suit any kitchen. 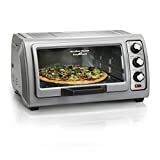 Standard Toaster Oven: Ranging in size, these toaster ovens can toast up to six slices at a time. 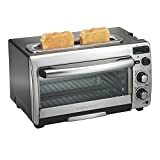 They have heat settings to make sure your toast is just the right golden brown that you like and sometimes include an automatic ejection tray to pop out the toast when it is done and timers for maximum convenience. These ovens are small and compact and perfect for toast lovers. 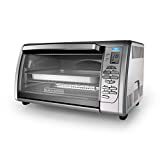 Infrared Toaster Ovens: Infrared toaster ovens are great time saves and they don’t require preheating! Infrared heat is directly transferred to food and they can cook up to 50% faster than other types of ovens. Another handy benefit is that frozen food does not need to be defrosted, making these perfect for people with a busy lifestyle. 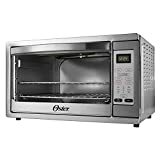 Rotisserie Toaster Ovens: These ovens include skewers for rotisserie cooking! They are a great convenience and can be an added asset when cooking over the holidays as an additive to your ovens. The come in many sizes and can cook up to four chickens at once! 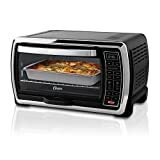 Combination Toaster Ovens: These can be straightforward convection ovens with a pop-up toaster above are handy space savers. With other added features like frying pans, steamers, coffee makers or even rotisserie function, there is a combination toaster oven to suit any meal! Great for small kitchens, having a combination functions, they are a convenient solution! Easy to clean: Ovens can be one of the hardest things to clean and commenters rave about ovens that are easier to clean than others. Finding an oven with non-stick coating will save you a lot of hassle and give you lots more cooking pleasure. Versatile: The more functions the toaster oven has, the more cooking variety people have and the happier they are with their ovens! Choosing an oven with extra features will give you a creative flare and more flexibility. Easy controls: People rate toaster ovens higher when they are easy to use and have handy controls. Style: Toaster ovens spend most of their time on kitchen counters. To ensure satisfaction, choose a style that fits into your decor. For fast, efficient cooking, toaster ovens with pre-programmed buttons for different types of foods are the way to go! Buying a toaster oven with an ejection tray will make sure your toast is just the way you like it. Saving you the hassle of having to watch your toast, these ovens will help manage those busy mornings. Non-stick trays and interiors make cleaning a breeze! Ovens can be difficult to clean but choosing one that is non-stick will save you a lot of hassle after roasting a chicken or baking a muffin! An added feature that can also keep your toaster oven clean and ready for action, is a crumb tray. These are loaded and taken out from the front and will make those toast crumbs easy to clean! Buying a toaster oven with a timer and an auto shut off or an alert bell will make sure that your food is as crisp as you want it and not overcooked. The wattage of a toaster oven doesn’t directly affect cooking time. Simply put, this number means the maximum power the oven will use if running for an hour at its highest capacity. If you are conscious of energy usage, then this is something to look out for. The best way to tell if the toaster oven you are deciding on will be big enough for your family is to consider the cubic foot measurement. You will need a minimum of 0.6-cubic foot capacity to roast a whole chicken. For more flexibility, buy a toaster oven with adjustable racks. These make it possible to cook more than one item at once (if you have two or more) or adjust heights for perfect cooking. Added features like pans, racks, crumb trays and even pizza stones will mean no recipe is out of bounds with your new toaster oven! If you need more than just breakfast toast, toaster ovens with bake, broil, and toast heating functions will be perfect for the job. Other advanced heating functions of electric toaster ovens can include pre-heat, defrost, roast and other baking functions to add variety to your oven. Looking for that authentic flavor? Toaster ovens that come with brick inserts can mimic brick-oven baking. It is always good to measure the size of the space you have set aside for your new toaster oven. That way you can compare it to the product specs and make sure it will be the perfect fit. 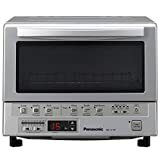 Panasonic: Beginning in 1918 in Japan, Panasonic’s goal is to contribute to the progress and development of society and the well-being of people worldwide by making quality home appliances and electronics. Breville: Breville launched in 1932 in Sydney, Australia, and invented the first sandwich toaster in 1974. In many parts of the world, the Breville name remains synonymous with this device even today. Waring: Entertainer Fred Waring introduced the world’s first blender in 1937, and today Waring is one of the home, foodservice, and laboratory industries’ leading manufacturers of professional-quality appliances. Cuisinart: Cuisinart started in 1971, and quickly introduced the United State’s first food processor. Today they manufacture a wide range of high quality kitchen supplies and appliances.